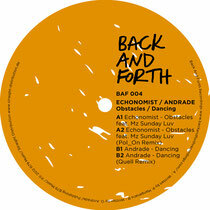 The Cosmic Cowboys’ Back & Forth label welcomes two of the hottest new artists around in the shape of Echonomist & Andrade for an EP of house music backed with remixes from Pol_On and Quell. Following on from a series of superb split artist EPs in 2011, Back & Forth kick off the new year with a release from two new artists who have already been building quite a following with their recordings for the likes of Dessous, Upon You and Poker Flat. 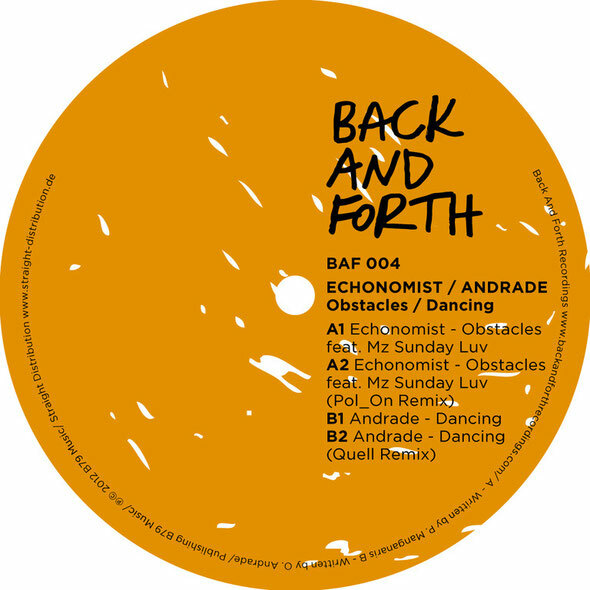 Greek producer Petros Manganaris AKA Echonomist takes control of the A-side, teaming up with vocalist Mz Sunday Luv for the wonderfully emotive ‘Obstacles’, a deep, melodic house cut that draws you in with its heady groove and heartfelt vocals. Following the original, ‘Obstacles’ is handed over to Polish production duo Pol_On who show why they have been a key act for labels such as Freerange and Systematic over the last few years. Their mix strips things back, using understated stabs and vocal cuts over a solid heads down groove to create a floor-filling and atmospheric reworking that is a true deep house killer. The flipside sees Parisian producer Andrade take over the reigns, turning in the wonderful ‘Dancing’, a dreamy and nostalgic track that uses Rhodes keys, strings, hypnotic vocals and a solid rhythm track to deliver a wonderfully catchy house track with a slight ‘80s feel. On remix duties, Berlin based producer Quell takes time out from recordings for the likes for Ibadan and These Days to drop his toughened up club reinterpretation that is bound to find favour on the floor in the months to come. Out 8th March.